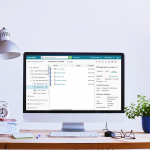 Laserfiche Connector 9 provides a streamlined, one-click experience for integrating Laserfiche with line of business applications such as CRM and ERP systems. It integrates easily through user-defined hotkeys and embedded icons. Search the Laserfiche repository based on fields from third-party applications. Basic and advanced searching is supported. If only one result is found, the document will automatically open in the Laserfiche Client, Laserfiche Web Access or Laserfiche WebLink. Launch Laserfiche Scanning and automatically populate metadata for the scanned documents with information from a third-party application. Connect two applications by allowing one of them to start the other (including the ability to pass parameters between them). Choose whether any of the above actions are activated from a keyboard shortcut, a button embedded in the application’s title bar or both. Laserfiche has confirmed compatibility with a number of applications, including Gmail, Salesforce, QuickBooks and Microsoft Dynamics, among others. Based in Long Beach, CA, with global headquarters in Hong Kong and offices in Shanghai, Toronto, Panama, London, Washington, D.C., and Fort Lauderdale, FL, Laserfiche uses its Run Smarter® philosophy to create simple and elegant enterprise content management (ECM) solutions. Since 1987, more than 35,000 organizations worldwide—including federal, state and local government agencies and Fortune 1000 companies—have chosen Laserfiche® enterprise content management (ECM) software to streamline document and business process management (e.g., accounts payable, case management, third party and contract management, records management).